On May 22, 1970, responding to a bogus emergency call to help a pregnant woman, St. Paul patrolman James Sackett was killed by a sniper’s bullet fired from a high-power rifle. The white officer’s assassination was the most shocking event in an era of shocking, racially charged events, punctuated by bombings at Dayton’s Department Store and elsewhere, police harassment and shootings of young black men, an alleged hijacking plot, and random acts of urban violence. A once peaceful, close-knit community, St. Paul’s Summit-University neighborhood had reached a boiling point, heated by racism and rage. 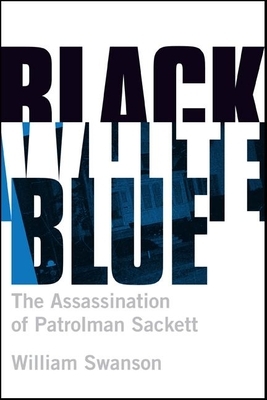 Award-winning journalist William Swanson masterfully walks the razor-edge between the grief and anger of a police force that lost one of its own and the deep-seated resentment and subsequent silence of a community that had many reasons not to trust the cops. Based on extensive interviews and archival research, Black White Blue recounts the details of one of the most extraordinary cold-case sagas in U.S. annals—a story featuring dozens of memorable characters, including a relentless “super cop,” an aggregation of conflicted informants, and a haunted woman who grew old with a terrible secret. The case culminates with the controversial trials, decades later, of Ronald Reed and Larry Clark. Black White Blue is a powerful, true account of crime and punishment, time and memory, race, community, and personal relationships. William Swanson is the author of Dial M: The Murder of Carol Thompson. He has written and edited for various publications in the Twin Cities and elsewhere for more than forty years.